One of the first images taken by the Discovery Channel Telescope was of the Sombrero Galaxy, M104. The image was obtained April-May 2012. The Sombrero Galaxy, also called M104 or NGC 4594, is about 28 million light-years from our planet in the constellation Virgo. It is so named because the halo surrounding its disc is unusually large, making it look like a sombrero. "Close inspection of the central bulge shows many points of light that are actually globular clusters. M104's spectacular dust rings harbor many younger and brighter stars, and show intricate details astronomers don't yet fully understand," stated the NASA website Astronomy Picture Of The Day in a July 2013 entry. Examination of the galaxy in recent years revealed that it had a sort of "split personality," NASA said on another website, showing that is a large elliptical galaxy that has a disk galaxy embedded inside of it. The reason this happened is still poorly understood. It's unclear exactly who discovered the galaxy — Pierre Mechain or Charles Messier. Also, William Herschel found the object independently in 1784, even though it had already been discovered by others. Messier was compiling a list of objects that are not comets in the sky — he was an avid comet-hunter frustrated by false sightings through looking at galaxies and nebulas. Now known as the Messier catalog, the original set of objects did not include what is now known as M104. Messier, however, wrote about the galaxy on May 11, 1781, in his own copy of the catalog, according to the European Southern Observatory. Mechain, who also surveyed deep-sky objects, mentioned he had found the galaxy in a letter dated May 1783, while Herschel — who is perhaps best known for discovering the planet Uranus — tracked down this object independently in May 1784. Herschel also remarked on a dust lane surrounding the galaxy, making him the likely first person to observe it. He was using a bigger telescope than Messier, ESO stated, so that was why he was able to see it. A notable early discovery about the Sombrero Galaxy came in 1912, while astronomers were still trying to figure out if the "spiral nebulas" (as spiral galaxies were then called) and other galaxies they saw in the sky were in fact separate from our own Milky Way. Vesto Slipher, an astronomer at the Lowell Observatory, observed a red shift in the Sombrero of 621 miles (1,000 km) a second. Red shift describes how the spectra or light pattern of objects becomes shifted toward the red end of the spectrum as they move away from Earth, stretching their wavelengths toward the longer red ones. (Objects moving toward us are blue-shifted, with shorter wavelengths.) It's one tool used to describe the expansion of the universe. "In those early days this measurement was very significant, because astronomers at that time thought that spiral nebulas (as they thought M104 was) were part of our own Milky Way galaxy. 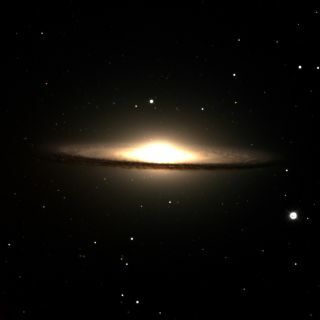 The large red shift meant that M104 was probably outside the Milky Way," ESO stated on another page about the Sombrero. In 2012, the Spitzer Space Telescope examined the Sombrero Galaxy and discovered one galaxy embedded in another. This reclassified the Sombrero from a "flat disk" galaxy to an elliptical galaxy with a flat disk inside of it. "Visible-light views missed the elliptical, or more round, nature of the galaxy, because the old stars dominating the elliptical structure are very dim when viewed at visible-light wavelengths. These same stars stood out when viewed in infrared light by Spitzer, allowing astronomers to re-classify the galaxy as an elliptical with a disk inside," NASA stated at the time. "Within the elliptical is a flat disk galaxy," the agency added. "The disk itself shows hints of an inner, bright disk separated by a slight gap from an outer ring. The disk galaxy falls well within the bounds of the outer elliptical." The galaxy also likely hosts a supermassive black hole in its center, a discovery that was revealed in 1996 through observations by the Hubble Space Telescope and the ground-based Canada-France-Hawaii Telescope (CFHT), among others. "The gas and dust in this disk are swirling into what is almost certainly a massive black hole," APOD wrote in October 1997. "The disk is probably what remains of a smaller galaxy that fell in hundreds of millions of years ago. Collisions like this may be a common way of creating such active galactic nuclei as quasars."